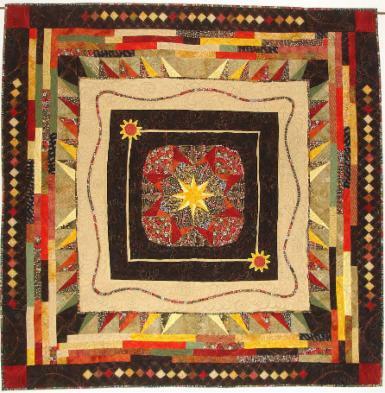 Gallery 2009-10 - The Joyous Quilter - Quilts and Patterns For Sale, Commissioned Quilts, Quilt Gallery, Quilting Tips & Tricks, Quilting Green and more! Here is the second of the four page picture gallery to show my journey of completed quilts for you to browse and enjoy. Some are commissions, some became treasured gifts to friends and family and a few remain in my possession. If you would like a unique and beautiful gift made for a friend, a member of your family, or to simply indulge yourself, JQ would be delighted to hear from you! 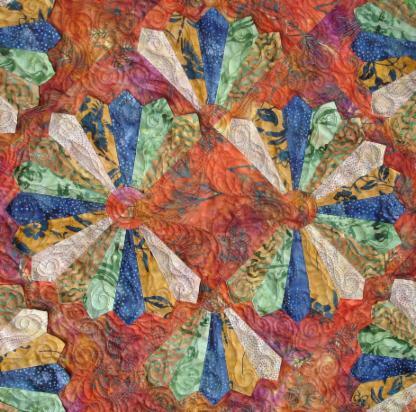 Take a look through the Commission Gallery page which showcases those quilts, JQ has been commissioned to make so far, in more detail. A complete set of table mats and napkins with napkin rings, made as a wedding present for friends based on the "Table Graces" pattern, in fact the bride's name is Grace! The gorgeous centre fabric was much of the inspiration, coupled with the fact that Grace loved the combination of cornflower blue and white which made for a very fresh look. Having volunteered for the Guild FunDay Committee, this was my sample for the chosen pattern which was based on using a jelly roll*. I chose the “Peace on Earth” range by Moda which had all these warm and rich looking fabrics. Extra yardage in the same range completed the setting triangles and border. Quilting this was really fun for two reasons; I decided to quilt each block differently, like a sampler for quilting stitch designs, plus I had recently purchased the book Hooked on Feathers by Sally Terry which turned out to be an absolute inspiration - thanks Sally! 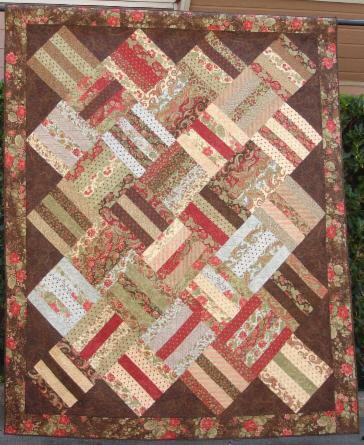 I quilted feathers on the setting triangles and borders which turned out to look fabulous, even though it was only my first attempt! *A Jelly Roll is the fancy name for 40 strips of co-ordinating fabric, (usually from the same manufacturer from a particular fabric collection) all cut across the width of fabric to the same strip width, in this case 2.5". 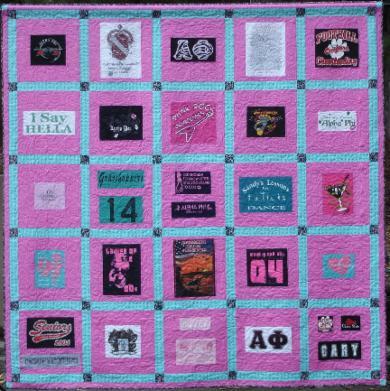 This was the Breast Cancer Quilt for 2009, raising funds for our local hospital Breast Care Unit. It was constructed by several Piece by Piece Guild Committee members including myself. 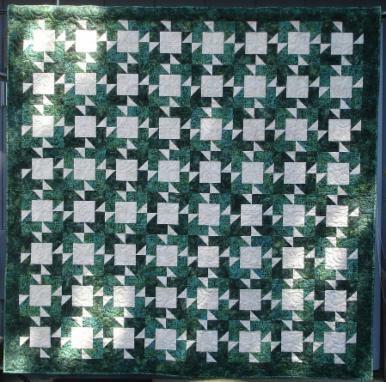 We began with the inspiration of a feathered star which was square, but we needed a Queen size, so I used EQ6 software to extend the pattern by using complimentary blocks and borders. I downloaded fabric images into EQ6 from the manufacturer’s website which meant the colors were true, making it easier for us to choose one of the many color combinations with accuracy. 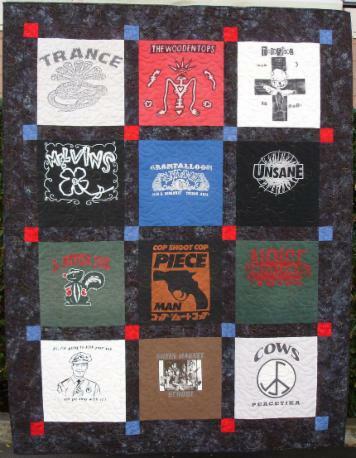 The quilt measures 102" x 84". 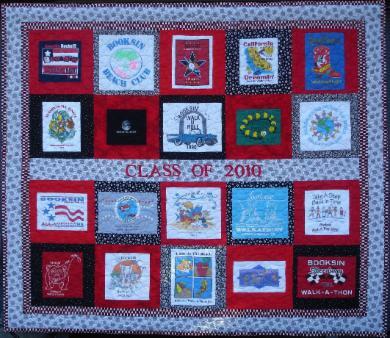 I am pleased to report that this quilt raised around $3500 for the local hospital. 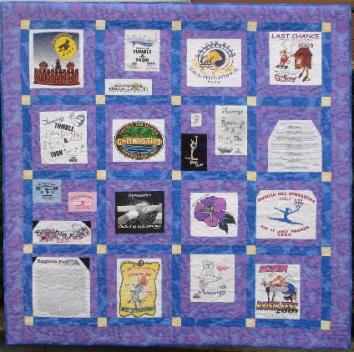 The drawing took place on October 15th, 2009, and the young lady who won the quilt was delighted. 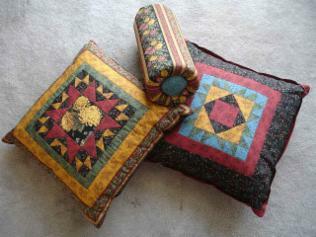 These cushions were made from the leftover fabric after the "Star of Hope" Quilt was completed. 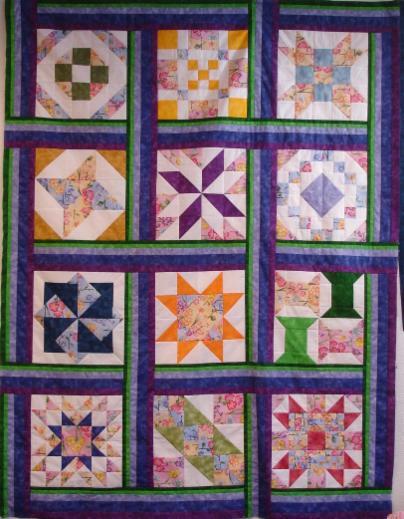 Each of the blocks is identical to the smaller blocks on the main quilt; the bolster used up the leftover striped border fabric. All three cushions were included in the prize. All cushion covers could be easily removed for laundering. 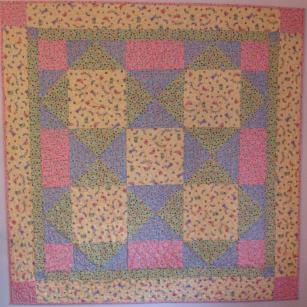 I had the privilege to have taught a young (12 yrs) girlfriend to quilt and together we made two of these baby quilts. We made two identical quilts as I had a baby shower coming up and I had a hunch that she would like to keep the other - one's first quilt is far too sentimental to give away! Considering this was the first thing she ever made, she did a fabulous job, she even helped to design the quilting pattern! 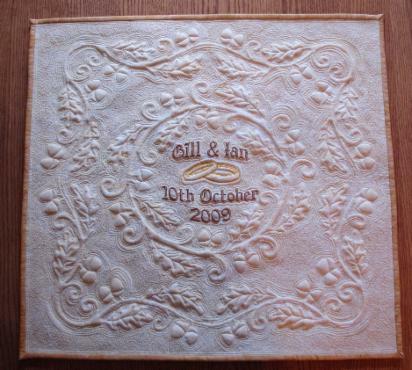 The other was very well received by my friend who had a baby in July 2009. 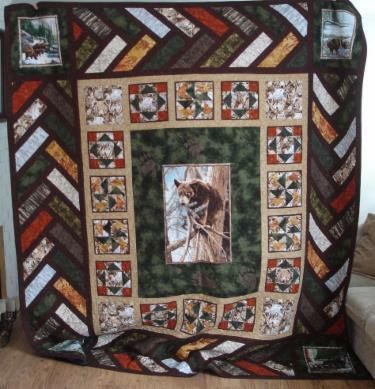 When my cousin visited me in CA, she found fabric with faces of wild American creatures and so the theme of the quilt was built around that, based on a pattern in a magazine. I found the bear panel in Reno which worked perfectly as a centre piece. Adapting the original pattern size to fit a Queen size bed meant that the centre panel ended up with a large plain border so to provide more interest, I appliquéd bear paw prints based on examples found on the web. The original pattern was considerably smaller, so I had to recalculate everything to enlarge it to fit a Queen sized bed. I didn't measure the finished size, but in this picture a 6'4" man is standing behind it holding it up at arms length (and it's still not off the floor)! 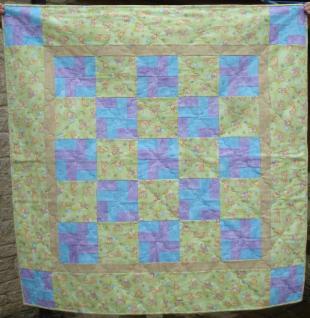 It was quilted using a pantograph allover pattern which looked gorgeous. To the right is the great fabric depicting a wild mountain snow scene which was perfect for the back and continued with the wildlife theme. I sewed the two sections together at the bottom of each giving the impression of a reflection although this picture only shows one half. 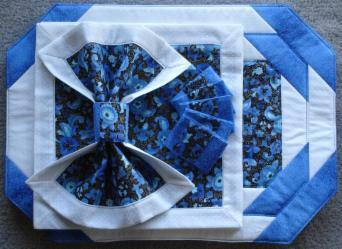 This one was made for the grandbaby of a dear friend of mine in England. It's warm and soft fleece. On the front are teddy bears wearing lilac bows around their necks and holding blue balloons which helped me choose the complimentary colors. Fluffy sheep are on the back to be counted when sleep is elusive! This was one of those occasions where the quilting worked out as beautifully on the back as it did on the front in terms of positioning. This quilt started out as a foundation piecing course that I attended and just grabbed fabric from my stash at the last minute. The pale lilac and royal blue batiks worked so well together and on rummaging further I discovered another fabric I'd bought a long time ago with a large butterfly print which I originally planned to put on the back. Looking at it after the course, I realized that the colors and tones of the butterfly fabric just worked so well together that it definitely deserved a starring role on the front after all and I made it feature as a secondary pattern. The back uses all the same fabrics and looks nearly as good as the front! 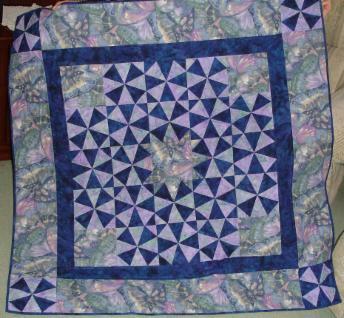 I emphasized a secondary pattern with echo quilting around the central and corner stars, plus emphasizing the optical illusion of the different shapes made around the centre. Finally I used free motion to emphasise the butterflies in the centre and border. This one I presented to my dear sister-in-law for her 50th birthday and she loved it! My adorable oldest nephew was 21 in June and is heavily into Subaru cars. 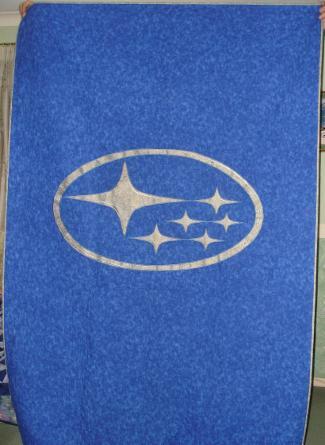 After a long and fruitless search for car fabric of a suitable nature, my brother inspired me to quilt the Subaru logo! After some innovative help from my hubby with the oval and a variety of software to create the necessary star templates, I got all the shapes into the correct size and proportion. The oval is approximately 33"W x 19"H to give you a sense of scale. The silver print fabric really worked well against the royal blue background. It's difficult to see in this picture, but all the stars and the ellipse have white and dark silver satin stitching to give the illusion of 3D. Judging by the huge grin when he opened it, my nephew loved it! This is the front of my brother's quilt whose 50th birthday this celebrates plus his retirement from the Fire Service a couple of months later. Two years ago I found the girls on bikes fabric and fire fighter scenes fabric but couldn't work out a way to combine the two and make it look right until I discovered a book called Easy & Elegant Lone Star Quilts by Shirley Stutz and found the inspiration I needed - Thanks Shirley! For each star I created a diamond shaped template with one side of the diamond length at 8", 6", 4" and 2". Each and every diamond was individually cut and then eight diamonds made each star and was tried in different configurations on my design board until it worked. I had to measure and cut the black background pieces as I went to fill in the gaps between stars. 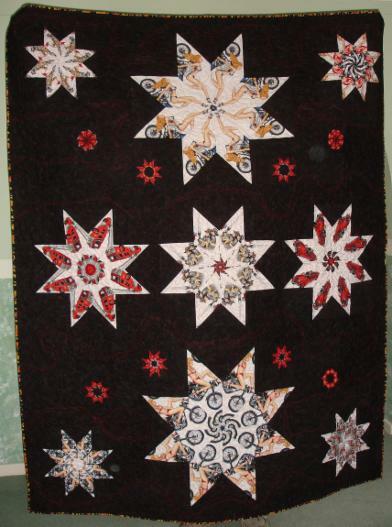 Placement of the outermost little red stars (which are in fact firemen’s helmets also made into stars) came about by happy accident and lend a certain movement to the quilt and broke up an otherwise huge black area. The quilting was terrific fun! I used red thread against the black background to lighten and create interest. I started with a ribbon effect which was made to look like bike tire tracks and then flames were quilted either side of the tracks, the flames on the binding fabric were my inspiration. The whole thing worked out beautifully and my brother was delighted! I woke up one morning with this pattern in my head and so set about creating my vision. People liked them so much I decided to create the pattern. Demonstrating it’s construction at a recent Quilt Shop Hop (5 days) I sold 73 patterns! The originals, shown top left, (2 sets of 6 mats & napkins) ended up in Michigan raising funds for an Assisted Living Facility run by a great friend of ours. 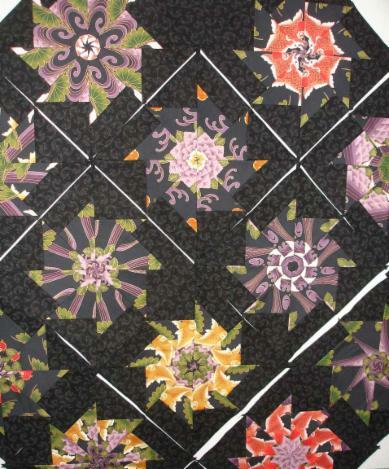 The others, shown bottom left, are a variation on the pattern. If you like this pattern and would like to purchase it, click here. 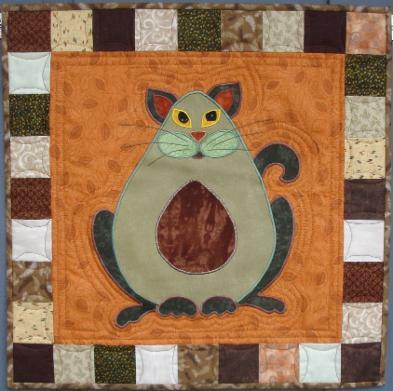 July 2009 ~ "Cat In My Window"
This 40"W x 33"H wallhanging was made to be auctioned off at a Fundraiser event for a charity that rescues cats from unfortunate circumstances and, wherever possible, rehomes them. Indeed, one of our own delightful furry friends came from there; the sweetest little guy with a gorgeous black and white coat. Those that cannot be re-homed for whatever reason get to stay in a loving and clean environment for the rest of their natural life. Here is a link to TownCats website where you may like to be kind enough to make a donation to this worthy cause. 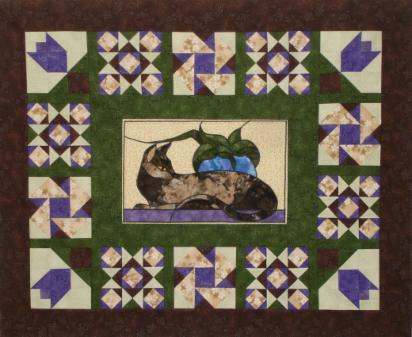 I am pleased to report that this quilt raised $125.00 for TownCats! August 2009 ~ "Lively Ivy"
This 20"W x 20"H wallhanging was my first attempt at a technique called 'Trapunto' which I have wanted to try for a long time, and I was rather pleased with the result. The Trapunto technique raises elements of the design so that it creates a 3D effect which is very tactile and would make a wonderful gift to a blind person! I worked on another Trapunto piece (different design) which is a commission from a friend of mine who gave it as a gift to other friends of hers who are getting married later this year. See "Oak Leaf Wedding Ring" below and my Commission Gallery for more details. August 2009 to July 2011 ~ "Carp-e Diem"
I belong to a small group (4 of us) of gals who meet on a regular basis to have fun sew days. Amazingly we discovered that none of us had done a "Stack & Whack" before despite having quilted for many years, so it became our latest project. I had this gorgeous Asian large print fabric with red and gold Koi Carp (hence the pun in the name!) in my stash for many moons and, on investigation, there were not enough repeats lengthwise (needed eight but only had five), but there was a repeat across the width of fabric, however it wasn't exactly identical - during the printing process the fabric must have shifted or distorted slightly. I overcame this problem by cutting four from one side and four from the other and alternating them, which not only saved the day, but created some interesting and subtle secondary patterns within the stars ~ a happy accident! I was planning to do undulating flying geese around the edge as a border with some of the original fabric as well as some complimentary fabrics I had purchased. However, as can sometimes happen, I completely changed my mind and finally finished this one in July 2011 - see that gallery page for the completed version! Like the Circular Seagull in April 2008, this year we did another. This time we all had half a yard of the same fabric (Bush Banana from Australia) as the theme which ran throughout all our quilts - eleven in total. 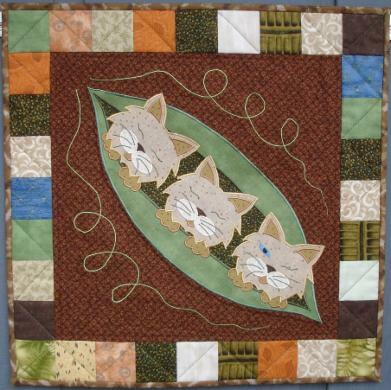 They were all shown in our local Harvest Quilt Show which the whole town turns out to see. I created the central yellow and red star using Carol Doak's beautiful paper piecing book 50 Fabulous Paper Pieced Stars and then it was passed on for successive borders to be added. Thanks to Betty, Jenny, Linda and Trudie for each of their borders, and thanks to Carol for my original inspiration! September 2009 ~ "Rock On!" 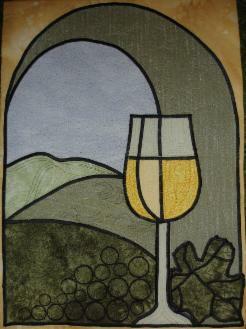 Commissioned quilt; for further information, see Commission Gallery. September 2009 ~ "Oak Leaf Wedding Ring"
October to December 2009 ~ "Football Fantastic"
December 2009 ~ "A Transport of Delight"
August to December 2009 ~ "Wine Label Inspired"
In between all the commissions I managed to find a little time to create this little wallhanging which measures 20"W x 29"H.
This was inspired by a wine label and mpst of the pieces were appliquéd and then satin stitched. 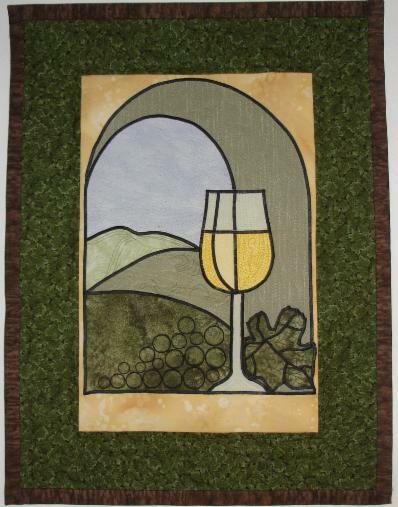 The grapes, however, were produced by programming my embroidery sewing machine and hooping up the fabric to get the perfect circles which worked really well. To the right is a detailed image of the free motion quilting in which I was trying out a new technique called McTavishing which turned out to be a lot of fun - thanks Karen! 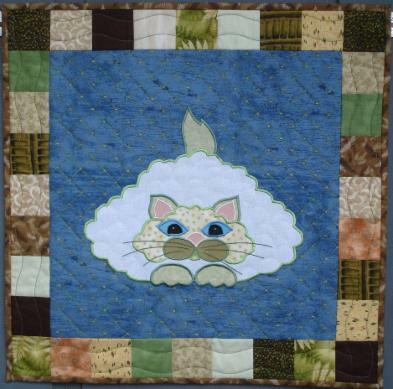 February 2010 ~ "Beam Queen"
May 2010 ~ "Celebrate Your Life"
June 2010 ~ "Memories of Grandpa"
July 2010 ~ "Veggie Cats"
I was flattered to be requested to make another quilt for the TownCats Fundraiser event this year. 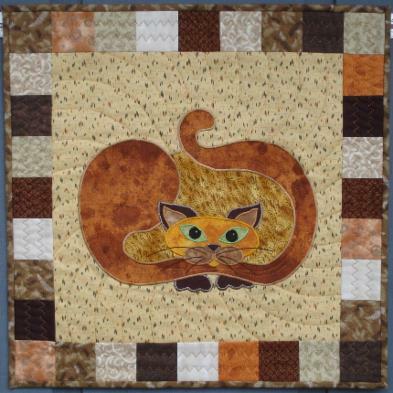 Last year's quilt was "Cat In My Window" above. Hopefully these whimsical moggies will raise a lot of laughs, as well as funds, as they are auctioned off for this worthy cause. 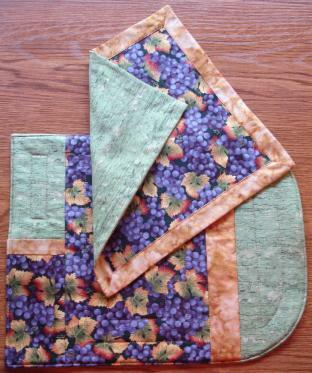 These four 18" square wallhangings were definitely a lot of fun to make and each is quilted differently. Choosing the different fabrics for each piece was an enjoyable and interesting challenge. Each piece was satin stitched with either matching or contrasting embroidery thread. 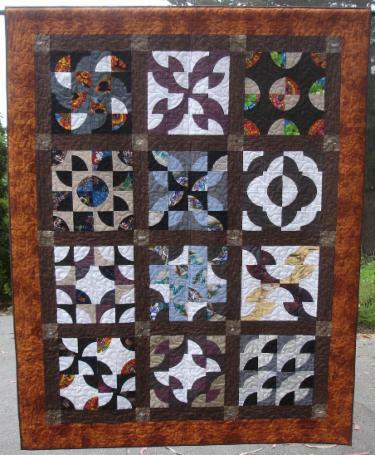 Much of the quilting was free-motion. Just looking at their faces often made me chuckle! TownCats are a non-profit organization rescuing cats and kittens from unfortunate circumstances and do their utmost to find them a kind a loving home. They have a 100% no-kill policy and so if a home cannot be found, they have a wonderful facility where the cats will be cared for in a loving environment for the rest of their life. August 2010 ~ "Vision of a Geisha"
I had a lot of fun making this quilt as a sample for the quilt store that I enjoy working in part time. We had this gorgeous 24" panel on the shelf in three colorways for some time but, surprisingly, only sold a few. 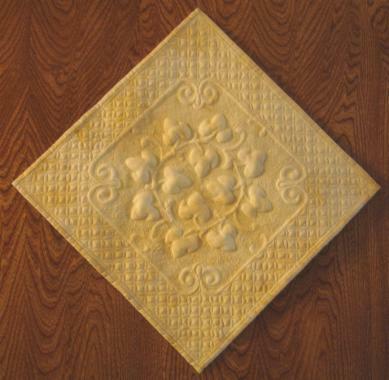 A wonderful pattern called Window on the East arrived at the store and we decided to make a sample using this panel. We made kits to duplicate the sample and the kits sold like hotcakes! Interestingly enough, many hubby's coming into the shop with their quilting wives have been drawn to this sample and have made many admiring comments! I used Trapunto beneath the Geisha which really made her stand out from the background (the photo does not do it justice! I shall endeavour to take some more detailed ones!) 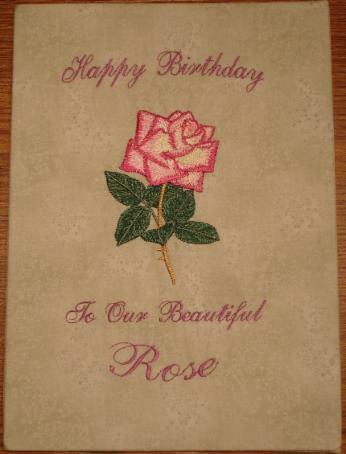 and then used embroidery threads in matching colors to free motion around most of the features on the panel fabric and top and bottom borders. The hubby's really liked the stitching around the Geisha, the birds and the wave on the border panel at the bottom; again I shall take some more detailed shots and add them later. August 2010 ~ "Life Is Beautiful"
August 2010 ~ "Forest Dance"
This quilt began life as a Fun Day project, but I adapted the block pattern to be a little different, plus I wanted the quilt to be larger. I had enough of the pale fabric and then I found the dark green fabric which matched the tone in the batik print. 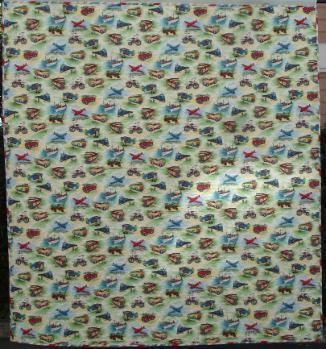 I then doubled the quantity of the blocks to make this quilt H" x W", and I was really pleased with the result. Commissioned card; for further information, see Commission Gallery. "There was a lot of excitement over the quilt drawing, so we moved up the time we usually drew the ticket. One of our Foundation Board of Trustees, won the quilt this year, and he was thrilled! We’re still tallying everything up, but our ticket sales were about the same as last year, and raised approximately $900. 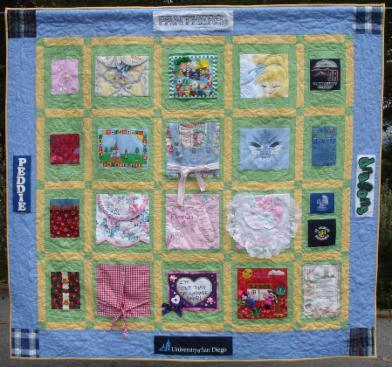 We’re very grateful to you and the Piece by Piece Quilters; the quilt is a huge draw to our event, and we enjoy seeing a new design hanging in our hospital every holiday season." Once again our Guild offered to make a quilt for the local Hospital in order to raise funds, and was raffled at the annual Festival of Light event. Myself and four quilting buddies worked together (having a lot of laughs along the way) using 25 different beautiful batiks. 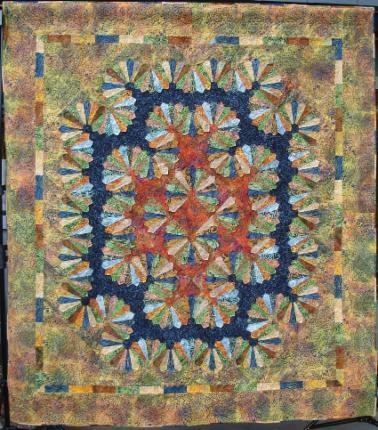 The original quilt pattern was designed by Anelie Belden who came to speak and do a terrific trunk show at our Guild earlier this year. She graciously consented to us using one of her beautiful patterns from her book, Thoroughly Modern Dresden, to create this quilt, and it was a lot of fun to make. Paying homage to the true origins of quilting, we used the leftover fabric from cutting the blades to make not only a striped inner border, but a striped binding! 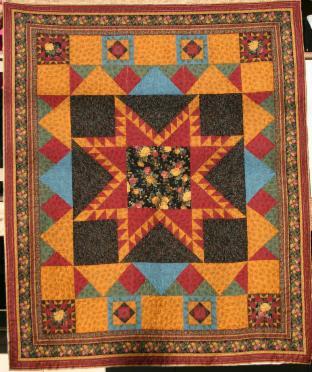 Each of the 'blades' are sewn onto the background in such a way that the end of the blade is loose and so the quilting had to be custom in order to make the most of these prominent features. I quilted the outer borders with feathers, each blade with a curly scroll and the background was filled with curls and swirls inspired by Karen McTavish's quilting style. Every year the quilt shop in which I work offer a block of the month (BOM) programme in three different color or fabric styles. We pick 12 blocks and those that sign up for a small initial fee each get a little kit of fabric and instructions. When they bring back their previous months completed block on a certain day they get the next month's kit for free. This year I was excited to be in charge of putting the Floral blocks together. As a basis there were three fresh spring-like fabrics in the same floral design but three different color ways; blue, pink and yellow. I chose to use complimentary Moda Marbles which each appeared in the feature fabrics. Each block has a white background fabric which was consistent throughout the whole set of blocks. At the end of the year we design a setting for the 12 blocks and offer completion kits. To the left was my idea which I was really pleased with as I enjoy optical illusions and this one had a woven effect. To achieve this you have to sew partial seams, but these are really not as difficult and many people think! It's all down to the order in which then seams are sewn.